Earlier this year, I got the chance to work with the team at Bandito Brothers and Oscar winning documentary director Freida Lee Mock on her latest documentary entitled "Anita" destined for its Sundance 2013 premiere! 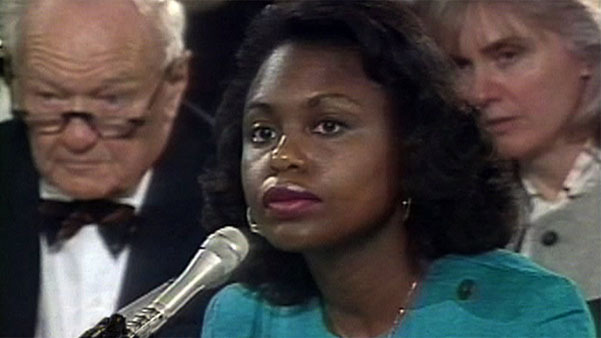 The film takes a retrospective look at the story of Anita Hill more than 12 years after her testimony at the Clarence Thomas confirmation hearings, regarding the sexual harassment allegations aimed at the soon-to-be Supreme Court Justice during her years working under him. This is Freida's 12th film, and her strength and passion for the subject is as strong as ever (Freida won the Oscar for her 1995 documentary "Maya Lin: A strong Clear Vision"). From a color grading perspective, the film offered some unique challenges as it combined recent interview footage of Anita and other subjects shot on Panasonic cameras, as well as numerous amounts of archival material pulled from every imaginable analog format from the early 90's. The footage ranged from Betacam SP broadcast tapes to master-less VHS grabs from the time. From a visual continuity standpoint there was a lack of cohesion in the original un-color corrected cut. Working with Freida, we decided to bring the dull and colorless archival footage too life, by giving it a gamma curve and color palette that more matched the feel of the modern interview footage. While each and every format took a different technique to get there, we were able to greatly enhance the older news footage to give it a "more filmic" contrast along with "punchier," "more saturated", colors that brought it more to life. What we found that there was actually an incredible amount of information available in these old analog formats and we were really able to make shots that had seemed so lifeless on C-SPAN and other news outlets, really come to life with a vibrancy that I think surprised me more than anyone else! For the interviews we employed a number of techniques to enhance the interview lighting to really flatter the subjects even more. Using power windows, highlight retention techniques, and even a subtle "post pro-mist" filter or two, we were really able to give all the interviews a much softer feel than was achievable on set at the time of production. Overall, I have to say this project was one of my favorite projects of 2012/2013. Working with Freida the post team at Bandito was an absolute joy, and being able to work on a film that I believe contains major relevance to our cultural and social perceptions today was truly a gratifying experience. 2. Thanks for your post, I think it is very help full who use Digital Cameras. If you need any Camera , Mirrorless System Cameras, Digital Cameras, Action Cameras,Film Cameras , Lens,Mobile & Tablets, Mobile, Camera Accessories and Sport. Please view my site. We are a fast growing company and we have become a respectable and reputable wholesaler for professional Electronics.